A Northern California man accused of attempted murder in the shootings three U.S. Homeland Security agents with an assault rifle has been charged, the Sacramento Bee reports. Victor Flores, 20, was indicted Tuesday in connection with a May 3 shooting outside his home in Petaluma. 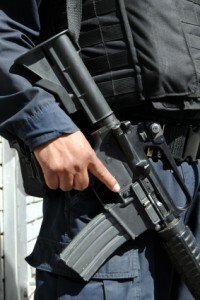 At the time of the shootings, federal agents were investigating Flores in connection with the murder of three rival gang members, the Bee reported. Two of the agents, who were not identified, are still recovering. The third has returned to work, the Bee reported. Posted: 8/2/12 at 9:10 AM under News Story.